Seeing the executives in their expensive designer get-ups, sitting at the glass and chrome table in their high-rise office, the singer realizes where the other nine dollars are going. She decides to “self-publish” her music by posting her “album” on her own website and allowing fans to download it for one dollar, thus saving her happy customers nine dollars per album and still netting one dollar for herself to pay her expenses. On the first day she has ten thousand downloads, and then the movie ends. I wonder how well she did. What was she giving up? What did she gain? These are questions that aspiring authors ask all the time, especially professionals such as physicians, business owners, consultants, and other specialists who would like to expand their businesses and increase name recognition by publishing books. What is the best route to take: traditional publishing or self-publishing? What do I give up and what do I gain? 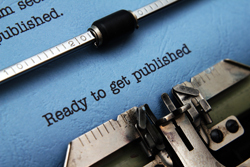 Self-publishing, or independent publishing, is gaining broader acceptance every day. At one time, book buyers thought the only reason a person would self-publish is because the book was rejected by a “real” publisher – those days are gone! One out of every three eBooks sold on Amazon is self-published. In this blog post and the next, we’ll look at some convincing reasons for new authors to take the self-publishing route. There is a lot of satisfaction in making a success out of something that others deem to be a weak prospect. In the movie mentioned above, the successful artist had been rejected initially by the label, but she went ahead and recorded her album regardless of the rejection. Money is one of the main reasons as to why self-publishing or “indie” publishing has taken off. According to Judith Briles, The Book Shepherd, traditional publishers used to pay a ten percent royalty on the cover price for a hard cover and less for a soft cover. In addition, publishers did a thorough edit of the book and invested in marketing. No more. Today, publishers give books a cursory edit and expect authors to invest in the marketing. Royalties are now paid on the net revenue, meaning that authors may earn between seven and eight percent on the amount left over AFTER the retailer takes their discount, which works out to less than a dollar a copy for a twenty dollar book, depending on their contract with the publisher. This is for the first five thousand copies. Higher royalties are paid for each additional block of five thousand copies sold, but since most books don’t sell five thousand copies, in effect this means that only celebrities and bestselling authors make money under the traditional publishing model. The most important thing for a self-published author to remember is this: In the absence of a traditional publishing company, the author IS the publishing company, and must undertake that business seriously, understanding the risks and rewards as thoroughly as any entrepreneur. Businesses require an investment. Independent publishers can expect to invest money for editing, cover design, page design, layout, proofing, and other expenses. But the return on their investment is much higher than if a publisher were to cover some of those expenses. In our next blog post, we’ll explore four other reasons to self-publish. Thanks for posting a comment, Leesa. The control that indie publishers can exert over their publishing BUSINESS is generally a good thing. In some instances, this control has been misunderstood, leading many authors to completely abandon publishing standards with the release of books with terrible covers, or text poorly formatted in Word. Publishers have always hired (and taken the advice of) experts to produce good books. It’s a shame that in so many cases, the enormous opportunity presented by indie publishing is being squandered.